Pros: Brilliantly acted with many intriguing themes and a fascinating woman at its heart. Cons: Brief and tantalising, the show does not dive deep enough into its subject. An accomplished, intriguing, interesting show about an accomplished, intriguing, interesting woman. Unfortunately, we never quite get to meet the real Eleanor Roosevelt. The King’s Head Theatre in Angel is one of the oldest (and best) examples of London’s growing number of pub theatres. Unlike many of its newer kin, the King’s Head is reasonably spacious and comfortable with tiered seating. Despite my visit falling on the hottest day of the year so far, the performance space did not reach unbearable temperatures – a real problem in many of London’s small pub theatres. 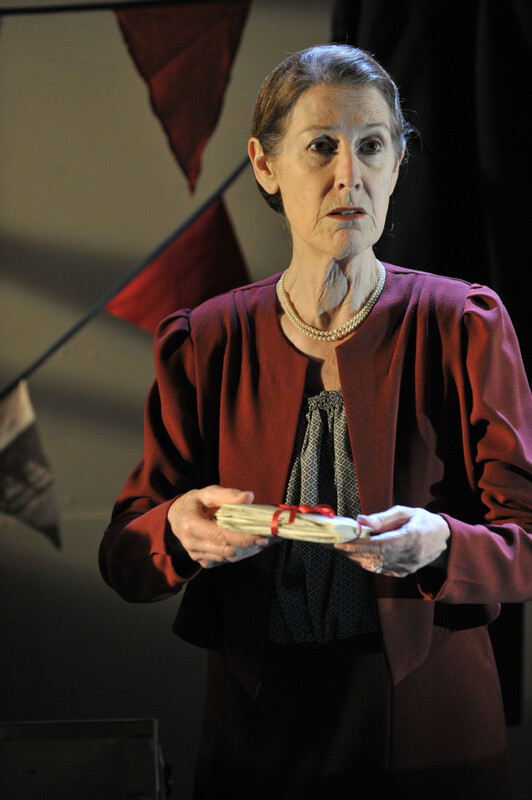 It was a lovely space in which to enjoy Alison Skilbeck’s interesting one-woman show about the life of activist, writer and First Lady Eleanor Roosevelt. Skilbeck plays Eleanor as an old woman looking back over her life, reminiscing and telling stories about her prolific work and the people she knew. It is an accomplished performance – understated and confident. With no supporting cast and the simplest of set and props, this production relies solely on Skilbeck’s considerable talents as a character actor. She slips easily into the character of each person and personage she meets; one moment she is prim Queen Elizabeth, the next Eleanor’s confident husband, the next an unlikeable and overbearing Winston Churchill. Anyone of a historical bent would find the show worth watching simply to see Skilbeck so skillfully and suddenly become these well-known figures. Most importantly, Skilbeck makes a very likeable Eleanor Roosevelt. She captures Eleanor’s energy and enthusiasm, her restless, tireless need to act, as well as her self-doubt. What’s the point? Eleanor frequently questions herself, ‘Am I making a difference? What have I achieved?’ A great deal, as the play makes clear. Eleanor Roosevelt lived an incredibly eventful life; wife of a president, friends with radicals and activists, socialising with politicians and royalty, she spent her time campaigning, writing, touring. In Mrs Roosevelt Flies to London, we see her during her visit to the UK in the middle of World War II, supporting the war effort, raising morale and searching for solutions to any problems she came across. Unfortunately, the show runs for just 75 minutes and does not have time to really delve into the intriguing details of her fascinating public or private life, instead it skims the surface of her story in a tantalising way. As Eleanor remembers her trip to Britain, the narrative jumps in place and time, alighting briefly on each new character and theme. We are given just a snapshot, a few lines of dialogue, a brief explanation, before the show moves on. I would have liked to stop and delve deeper into Eleanor’s nature, her motivations, and her relationships. Instead, we are held at a slight distance from the play’s subject, given mere glimpses of an incredibly intriguing and complicated person – a person the play never quite managed to uncover. Similarly, the themes the play raises were interesting but could have been expanded on. Mrs Roosevelt Flies to London explores (among other things) the difference between the public and private versions of people, the subjectivity of memory, the interactions of individuals with historical events, and love in its varied, complicated forms. There were some short, sharp moments of humour in the play, but I would have liked to see more. 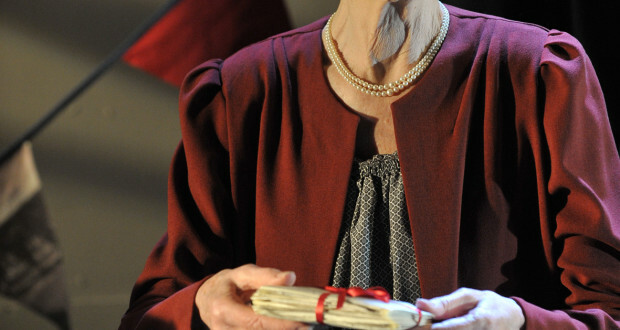 Likewise, there were some brilliant moments of sympathy and sadness – for me, these were the strongest parts of the show, moments in which we glimpsed Eleanor’s real character and saw her as a person rather than a historical figure. Her emotions were bared; her sorrow and doubt were human and easy to identify with. For just a moment, the person behind the persona was revealed. Booking Until: 9 May 2015. Originally an English Literature graduate, Helen now works in marketing. She enjoys theatre of all kinds and particularly loves teenie-tiny venues and plays intended for kids. She is normally to be found curled up with a cup of tea and a book or holding deep conversations with the cats of South London.